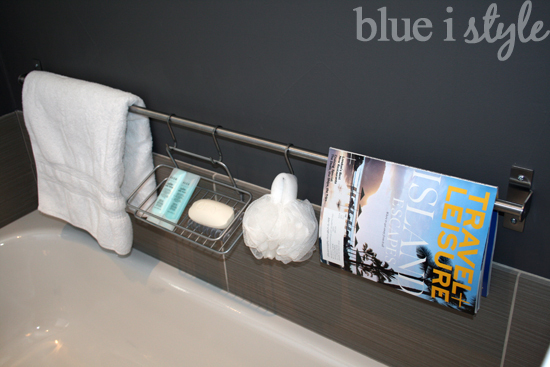 Stylish Bathtub Toy Storage that Transforms for Guest Luxury | Blue i Style - Creating an Organized & Pretty, Happy Home! Bath time with a toddler is so much fun! At almost 15 months old, Beckett is now really starting to enjoy playing with toys in the tub, but with that comes the challenge of storing all those toys. There is a small bathroom right off of Beckett's nursery, but it only has a shower. That means that bath time occurs down the hall in the bathroom attached to our guest room. We have plenty of storage space in the bathroom cabinet, but the problem was that by the time the tub toys finally dried, and I got around to putting them away in the cabinet, it was time for another bath. As a result, the toys ended up living on the edge of the tub most of the time. 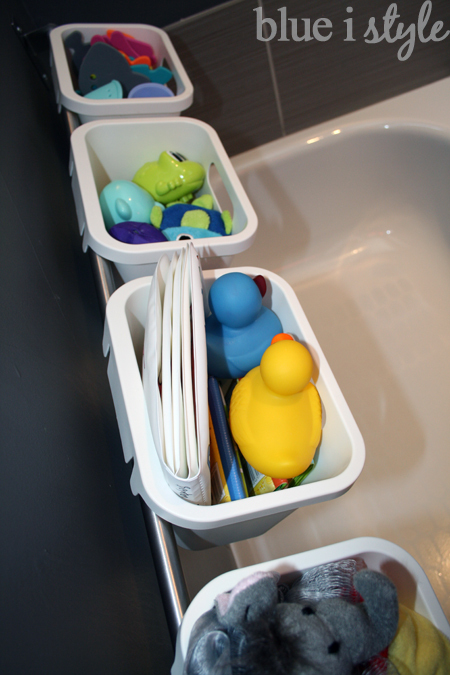 I had been searching for a new tub toy storage solution - one that would allow the toys to be quickly picked up and put away after bath time, even when still wet. While shopping at Ikea a while back, it occurred to me that the Grundtal rail system could be just the answer. I liked the coordinating white plastic Grundtal containers that are made to hang from the rail - but at $10-$16 each they were more than I wanted to spend. After a bit more searching around the store, I discovered that the Rationell Recycling Bins also fit onto the Grundtal rail, and at only $3.99 each they are a much better deal (these bins are no longer showing up on the Ikea website, but the Colorado store had a large inventory just a month ago). Update: These white bins are showing up on the Ikea website once again, but are now being called the Rationell Waste Sorting Bins. We decided to install the Grundtal rail just above the tiled tub surround, making sure it was positioned such that when hung from the rail, the bottom of the white bins would just overlap the top of the tile. Scott started by inserting an anchor and screw at the top left of the rail, then, after leveling the rail, he marked the locations for the remaining three screws and finished the installation. Because we want to be able to put the toys away while they are still wet, and allow them to properly dry, Scott used a small drill bit to drill numerous holes in the bottom of the bins so that all the excess water will drain right out. Once holes were drilled in the first bin, we hung it from the rail and filled it full of water to test it out. We discovered that because of the angle at which the bins hang, some water was pooling along the front edge. Scott drilled one more row of holes right along that bottom front corner of the bin and that easily solved the problem. With the bins labeled, I hung them back on the rail and filled them with all of Beckett's tub toys, as well as baby shampoo, body wash, and wash cloths. 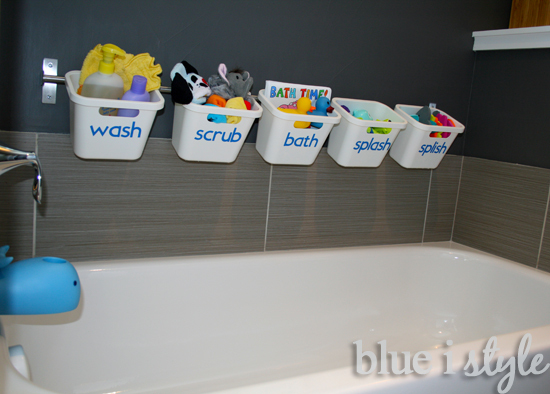 Quick, and simple, but oh-so-stylish tub toy storage! 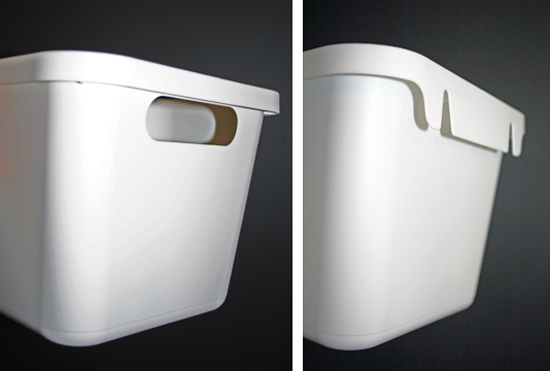 The bins hang securely on the rail, and are very light weight and easy to lift off. And the bins provide ample storage for all of Beckett's bath time toys! 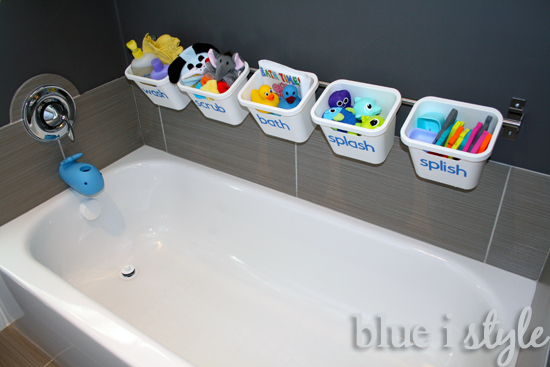 By installing the rail just low enough so that the bottom of the bins overlaps the tile ensures that we can put the away wet toys and the excess water will drain out without getting anything wet that shouldn't be. I love our new bathtub toy storage, but best of all, when we have guests visiting, the Grundtal rail can quickly transform from toddler fun to guest luxury! When friends come to visit, we want them to be comfortable and relaxed in the guest bathroom, and while bath tub toys are fun, they don't exactly scream relaxation. So to transform the rail for guests, we can quickly stash away the bins of toys in favor of more grownup bath time essentials. Since the guest bathroom doesn't have a towel bar, the Grundtal rail provides the perfect spot to hang a towel by the tub. 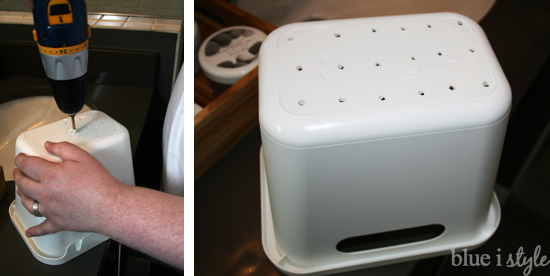 One Ikea Grundtal S-hook holds a loofah, while two more S-hooks hold a Polytherm Shallow Basket from the Container Store, which provides ample space for a bar of soap, body wash and lotion. Hi Angela! 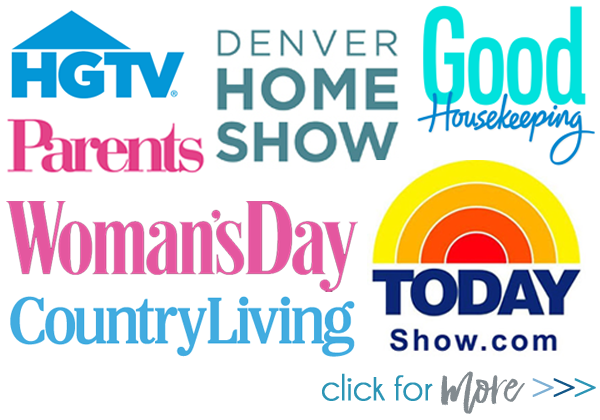 Thank you so much for sharing your post with me! LOVE this idea!! So smart! Love it! 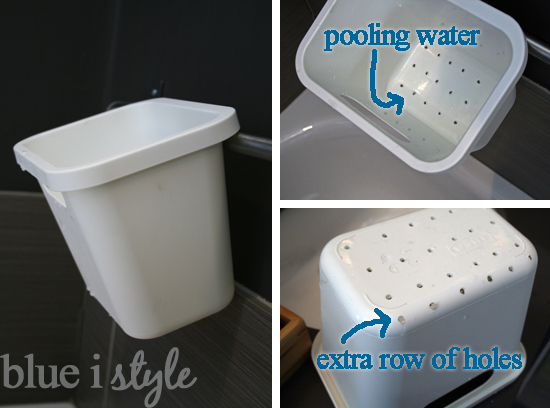 I love how you added the extra holes to the bins to prevent water pooling. I have that problem with a few things but never thought to do that! And I love your labels. Thanks, Katie. I can't believe how quickly he's grown up just in this first year, so it almost brings a tear to my eye thinking about how soon he'll really be grown up! Hey! Stopping by from the Iheart Organizing party. This is a fabulous idea! I'll definitely be looking for those buckets! Hi, Leanne. I was frustrated that I couldn't find those white buckets on the Ikea website any longer, but they are now back, just with a new name. They are now being called Rationell Waste Sorting Bins and you can find there at: http://www.ikea.com/aa/en/catalog/products/10169946/. Hope that helps! This is a great idea! I love that you can change it up for guests...or if you don't have little ones. 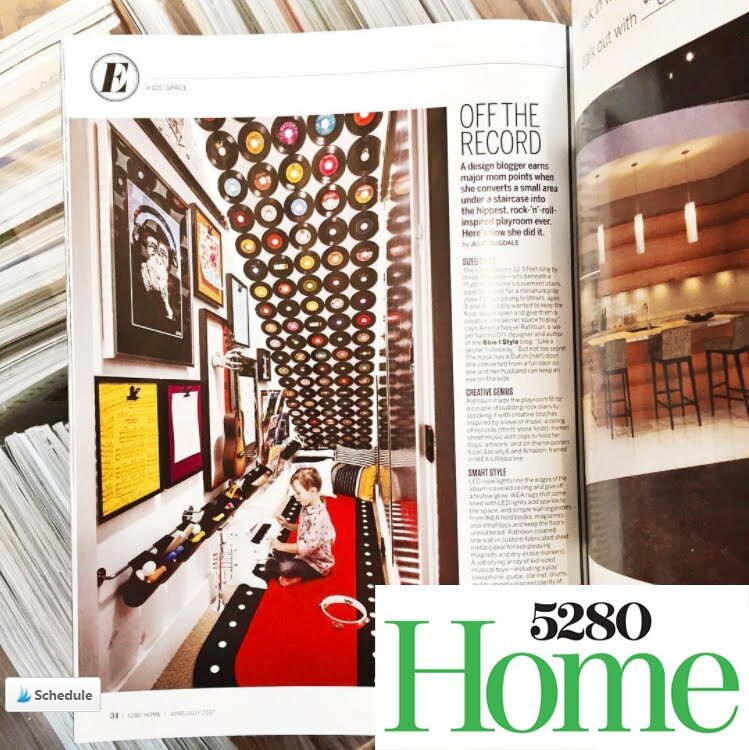 Awesome job! Thanks, Sharon. I really like the versatility as well! Love those labels! So stinkin' cute. Thanks, Beth. I'll be posting the details about how I made the labels at the end of this week if you want to stop back by! 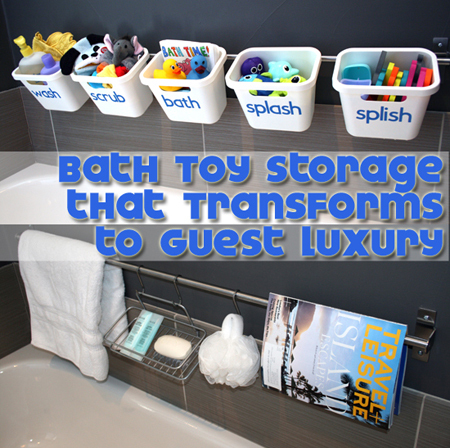 I absolutely love your tub toy storage! I'm so glad you shared this because I've been looking for a solution to how to properly drain the toys and how to store all the shampoos, etc. but anything I buy falls off the wall so your DIY system looks like it would work great... and its adorable! Katie, I'm so glad my idea is helpful to you! I'd love to see how it turns out if you do something similar! I love the idea! I will be copying you very soon. Just one question... Do you think the metall railing would rust with the water splashing on it? Kenia, good question. I wondered about that as well and did some research before buying the Grundtal rail from Ikea. From what I read, it is 100% stainless steel and should not rust. 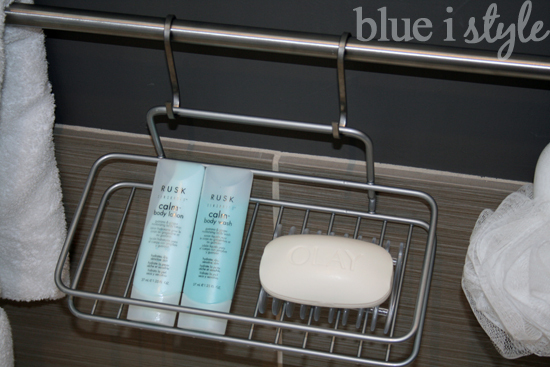 I read on several forums that people had used the Grundtal rail in their bathrooms (some directly in the shower) and that they had no problems of rusting even after a couple of years - so I don't expect the splashing in the tub to be a problem. It is probably a good idea, however, to cover the screws with silicone to keep those from rusting. Hi, i love your idea. Could yo please tell me whih is the lengh of the rail? Thanks a lot! Camelot, the length of the Grundtal rail that I used is about 31 inches. Ikea also sells to shorter Grundtal rails that are approximately 16 and 23 inches long. What a great idea! 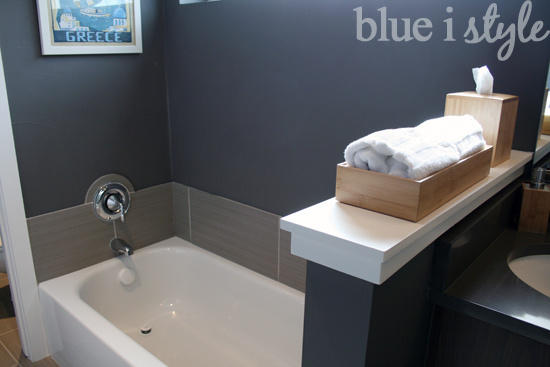 Can I ask what color blue you painted the wall with, love the color - it would be great in our guest bathroom. Thanks! Thank you so much - it truly is lovely! So cute! I love how it can be transformed for guests! I miss having littles and bath toys! LOVE this! Just pinned it to my Organizing Everything board. What diameter is the rail? I would love to try this with a curtain rod instead since we don't have wall to drill into. Do you think that would work? Julie, The rail I used is about 3/4 inch in diameter. By curtain rod, do you mean a tension shower curtain rod? I think that might work, but you would likely need to find a different kind of baskets because I the diameter of the shower curtain rod will be quite a bit larger. 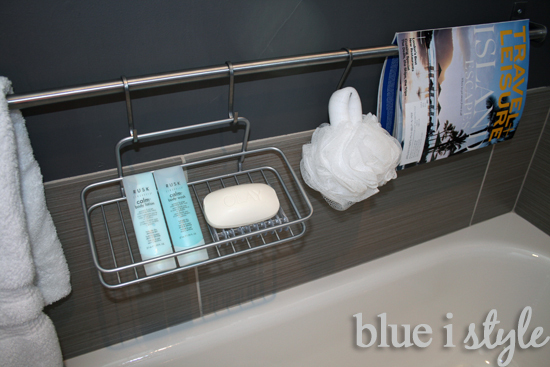 You might want to look for baskets with an open weave that you could have from shower curtain hooks. What a great idea!!! Definite pinning. 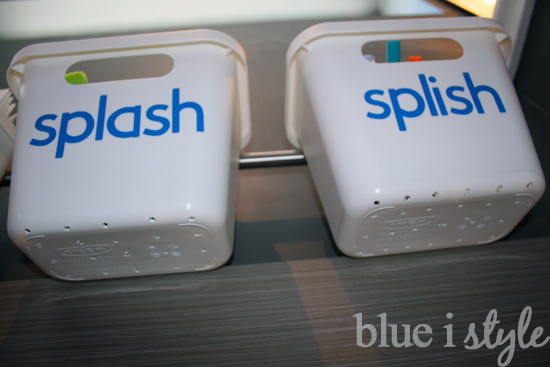 I would love these for the luxury items in my bathtub! Fabulous solution! 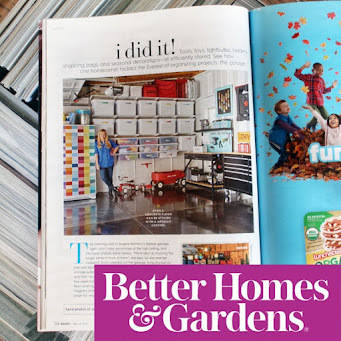 I love that you showed how to style it for the littles and mama! This is a great storage idea. Functional and looks great, too! Pinning this for sure! can't find the bins on ikeas site!! :( desperately need this in my life. any other bins you think would work?